In this week's Abundance Insider: Deceit-detecting AI, Facebook's new "village," and a world first in teleportation. What it is: Maluuba, a Microsoft company, has devised an new machine learning technique dubbed Hybrid Reward Architecture, enabling its system to generalize and learn much more efficiently, a key challenge in applying machine learning systems to games like Ms. Pac-Man, which have 10^77 states that might be encountered. By decomposing the typically single reward function into n different agents that can each learn in parallel, the team was able to create an AI that surpassed the all-time high human score, and in fact the highest possible score of 990,990, in less than 3,000 episodes. What it is: Researchers from the University of Washington recently created the first prototype of a battery-free phone powered by radio signals. The phone saves power by using analog versus digital voice encoding, and has a range that comes from tiny solar panels called photodiodes. In the future, the inventors hope to license the technology to current smartphone makers to enable emergency calls without concern over battery charge. Another direction for the technology is to expand the current prototype and create a bare-bones phone that would never need to be recharged but would still be able to make calls and send texts. What it is: Unanimous AI has created a method of leveraging the swarm behavior that we see in bees and other animals to augment our innate ability to detect fake or genuine smiles, effectively enabling a better lie detector. In recent research, 168 participants were tasked with identifying smiles in a set of 20 video clips -- either reviewing these clips alone or grouped into a group to act as a swarm connected over the Internet. Those connected via the Swarm AI grouping reduced the error rate from 33% down to 18%, or a 45% reduction..
What it is: Just two weeks ago, we featured the Micius satellite that a group of Chinese researchers used to experiment with quantum teleportation. This week, the same team created the first satellite-to-ground quantum network, and used it to teleport a photon from the ground to orbit for the first time ever. This MIT Technology Review article covers their experiments and the underlying science. What it is: Google's DeepMind and the nonprofit lab OpenAI have released a new paper outlining an experimental machine learning system that leverages human-technology teamwork to help an AI determine the best approach to learn a new task. This contrasts with contemporary approaches, which have AIs experiment with a variety of actions and fine-tune their algorithms in pursuit of a virtual reward. For this experiment, humans provided feedback to help a simulated robot learn how to do a backflip. The human feedback mechanism resulted in a successful backflip with under an hour of feedback, compared to the two hours of coding time an OpenAI researcher used to create a reward function (which, incidentally, produced an inferior backflip to the human-trained one). 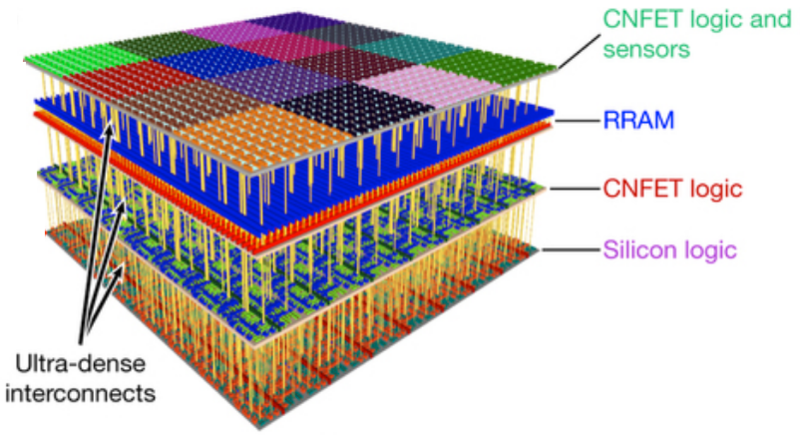 What it is: Researchers from Stanford and MIT have found a way to create 3D chips made from carbon nanotube field transistors that combine computing and storage in vertically stacked layers. Fabricated at temperatures less than 200 degrees Celsius, these chips overcome the current inability to stack silicon chips in a similar way. This 3D architecture is more energy-efficient, with faster memory and 1,000 times more connectivity than 2D architectures allow. Interestingly, the team was also able to leverage the ability of carbon nanotubes to act as sensor arrays, placing 1 million nanotube sensors to detect ambient gases. What it is: In an attempt to tackle Silicon Valley's housing shortage, Facebook recently proposed a plan to build 1,500 units near the company's headquarters. It will offer $10,000 in incentives for employees who move closer to their offices. Facebook said it wanted to invest in Menlo Park to construct a "village" with 1.75 million square feet of office space, plus an additional 125,000 square feet for retail shops. The 1,500 housing units will be open to the public – not just to Facebook employees – and 15 percent of them will be offered at below-market rates.